DNR: How do we reduce booze issues? 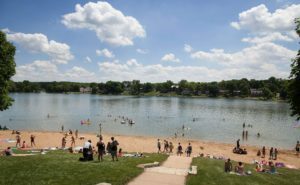 As Johnson County residents hoping to visit the Lake Macbride beach area learned this past July, it takes only a few to ruin things for everyone. After two large fights resulted in arrests for public intoxication and assault, the Iowa Department of Natural Resources chose to close the beach area early — 6 p.m. instead of 10:30 p.m. — effectively preventing many working families from enjoying the water during one of the hottest stretches of the summer. Park Ranger Gwen Prentice pointed to several incidents of rowdy activity at the time that she suspected were fueled by alcohol consumption. Although no news-making fights happened at Palo beach in Linn County, it also was closed early to curtail problems involving alcohol. Across the state — despite awareness campaigns and a beverage 17 percent alcohol content cap — a variety of incidents have occurred such as assaults, unconsciousness, public intoxication, drunken driving, property destruction, public urination, indecent exposure, underage possession, noise and trespassing. Similar nuisance activity prompted the DNR in 2010 to consider a temporary alcohol ban for state parks and public access areas on the Iowa Great Lakes in Dickinson County during high-traffic Independence Day. A narrow 4-3 vote by the DNR Commission defeated the proposal, but underlying issues remain. In many areas, including Johnson County, state-run beaches are the only public access areas that allow alcohol consumption. The move by cities and counties to ban booze on their property is thought to have moved that activity to state beaches. During holidays and other high-use times, the DNR has previously relied on state troopers or members of local law enforcement for increased patrols and crowd control. Stepped up enforcement, however, means an increased cost for taxpayers. When incidents occur outside of peak use dates, park rangers often are outnumbered by those involved in the disturbance, creating added safety concerns. Families generally have no interest in sharing space with raucous drunks. The situations created likewise are frustrating for nearby property and business owners. State budgets remain tight — in 2011, for instance, the Iowa DNR eliminated more than 100 staff members because of budget cuts. Officials are hopeful the public can help. How can the state reduce or eliminate alcohol-related incidents? Send a suggestion by phoning (515) 725-8488 or sending emails to jessica.manken@dnr.iowa.gov before close of business Monday. The early closures at Lake Macbride and Palo were unacceptable. Banning alcohol at the beaches isn’t likely to stop the issues, and will unduly punish the thousands of Iowans who drink responsibly and cause no trouble. Let’s work together to find the middle ground.